"Everyone's going to make the headset, they're going to figure out the video and then they're going to look at each other and go, 'now what?'" According to Ossic co-founder and CEO Jason Riggs, what's next for VR is 3D audio headphones that instantly calibrates to the listener. 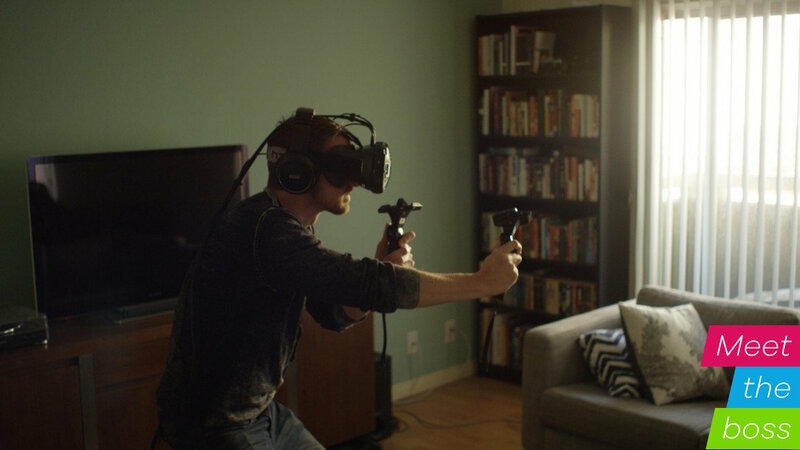 The Oculus Rift already incorporates the use of Head Related Transfer Function (HRTF) tech, combined with the Rift's head tracking to create a sense of true 3D audio spatialization. Consumer editions of the Rift - which are shipping out soon - include a detachable set of headphones which you can swap out for a pair of your own. The audio is spatialized and encoded in 360-degree surround sound to precisely match the video. But that's not nearly enough for Riggs and Ossic. The team wants their Ossic X headphones to be the last VR audio experience you'll have, because it's that good. These guys aren't rookies. Ossic is run by audiophiles with backgrounds from Logitech and Pioneer. They know headphones. But now with VR almost loose on the world, these veterans feel like it's time our ears were given the proper sound treatment they deserve. "Because audio is actually the more immersive of the senses. Visual is very engaging but in terms of feeling that whole sphere, that whole part around you, audio can do that." Riggs believes that audio is inherently the killer app for VR because of its ability to fully place you in another space. With accurate 3D sound in VR, you'll get precise auditory cues on top of visual so it will be easier for developers to "show" you where to look. That way, you miss nothing and get the full VR experience you're supposed to have. "Accurate 3D sound is going to be key. You don't want to break the sense of presence, or break the illusion. The sounds that are coming from outside your FOV (field-of-view), will make you turn and look at them - and when you do, you want to turn and know exactly what and where it is. "That accuracy is going to help with the fundamental premise of VR which is teleporting you to another place. A completely immersive experience and believing you are there." Ossic X headphones will cost you a pretty penny, but Riggs says they'll be worth it thanks to all the intense engineering and tech shoved inside the cans. Hearing Riggs explain how it works is like sitting in a university seminar on audiology. There are acronyms, random jargon and basically, lots of science that's gone into making the Ossic X's. To start with, the left and right sensors are lined up pretty well for our ears to hear, which is what the majority of generic headphones do. Riggs says we're like a bowling ball with two sensors because we're axisymmetric. Certain points are easier to hear in front and in back but there's a "cone of confusion" that's spread out around our noggins. To picture it, hold your arms out in front of you in a V-shape - this the area you don't normally hear with non-calibrated headphones. But that's where head tracking comes in. The HTC Vive and Rift already employ head tracking but the Ossic X comes with the tech as well. Riggs explains why. "To really believe something is there in space, in the room with you, it needs to stay put. As soon it starts to turn with you, it destroys any illusion that it would be there. "It's the same way with VR. There's a reason VR has to track. If VR was just a head mounted monitor, that would not be very immersive experience - so we need the same thing for audio. "Head tracking sensors are mostly for that, to keep things fixed to the frame of reference so they stay there in space and also help you resolve some confusion in the confusing areas that are in front, back, up, down." Putting on a pair will instantly calibrate to the individual anatomy of the listener through head related transfer functions. Normally, you'd need several hours of calibration with a sound lab to get the right effect. Each time you use the Ossic X, the headphones are calibrated to provide the best sound, then re-calibrated if your friend wants to use them. The second point of calibration is done through studying ear anatomy, more specifically the pinna - or the outer-rim your ear. Because each ear is so unique - the company has a huge database on hundreds of ear shapes - there are certain frequencies that bounce around differently. "The trickier part for us to do is your ears, because they vary so much. That (ear variation) totally changes the frequencies you get from the reflections which are the things helping you resolve the confusion in space." The sensors are also measuring head size and ear spacing to make sure all the cues are roughly accurate enough to match the size and space. This is done through a small grid of transducers which are "beam-steered" at high frequency so the sound interacts with the ear from the right angle. Beam-steering is controlling sound and placing it where it's needed. The last chunk of engineering is done through 8 drivers that work in tandem to play it all correctly back to your ear. The drivers work with the head tracking where sounds will appear to come from outside your head and stay fixed in to make you think there's a giant sound system setup in front of you, when in reality, all the sound is simply coming at you from the headphones. This is all done on top of testing on real people and 3D printed heads which is taken into an actual theater space where measurements are taken of the HRTF in every point in space. The team then put headphones on with the same points, which is then rendered on a computer to see if the same measurements can be collected. Riggs says this is the objective goal, "That this thing can absolutely recreate the sound you would get from a speaker at some point in space - at all points in space, ideally." There are other use-cases aside from VR - music, gaming and movies - which could potentially do well since the Ossic X cans fall into the same pricing tier as Beats, Bose and other high-end headphones. "Starting with high-end PC gaming, high-end VR headsets, which really right now is about Oculus and Vive. Maybe we'll also get into PlayStation VR and see how that works. That will probably be the mass high end experience, I suspect." It's unclear if many people will want to chuck $400 at the company, but with a little over a month to go as of this writing, the company's Kickstarter has already surpassed its funding goal by well, a lot. But Riggs believes in the best quality user experience paired with the best quality sound product. He and the Ossic team want to also set the standards for the industry to ensure other headphone makers produce top notch products too. "We're a little leery about that because fundamentally we know they're not taking into account the anatomy, not taking into account the output device. So what it means from those people is you'll get a bad experience where you'll get some spaciousness and the expense of quality. "We hope we can influence the industry so there are standardized outputs that will allow everyone to evolve state of the art 3D audio even after the content's been created."